We had a call during the week from a gardener in the borough of Merton who had managed to cut through the cable of the garden lights that they had had installed a few years ago. They had been thinking about upgrading for a while now and this accident was the prompt. We were pleased to learn that it had been a recommendation by mouth from a friend who had used our services to install exterior garden and patio lighting in Sutton last year. After a short chat on the phone about the sort of thing that he was after, we arranged to pop round en-route from one job to another to take a look at the size of the garden and to sort out the details of the job. The old system had been inadequate as it was an amateur installed 12 volt line in what was a good sized garden with a large loop of post mounted halogen lights. The control system was no more sophisticated than plugging and unplugging the transformer! The problem with 12 volt systems is the voltage drop on the cable. If you place too many halogen outdoor lights on a long cable run, even using low rated bulbs, could mean that your garden lighting system may not work reliably. 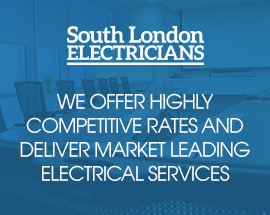 Calling in professional Merton electricians like ourselves to install your outdoor lighting will ensure the disappointment and the time taken to solve the problems makes it worth your while. While you are out at work or out enjoying yourself, we install the lighting, make good the garden and when you get home you have a fully functional outdoor lighting fitted stress free. Following the visit, the Merton garden owner took on board our advice and opted for an LED outdoor lighting system that illuminated the main path using a mixture of high quality stainless steel LED post lights and recessed lights, LED flood lights for the decking with a couple more floods mounted on the house wall to light the driveway. The control system allowed both the systems to be run from a timer and the floods were to run directly off the mains and also be PIR controlled for greater efficiency. So once the system was designed, the actual outdoor lights needed to be sorted. To decorate the edges of the paths, decking and steps we use Lumena products. We use these as we never compromise on quality. The Lumena lighting range has a wide variety of recessed units, mainly manufactured from marine grade stainless steel and aluminium. Our customers like the idea that their outdoor lighting will look as good as the day they were fitted 5 or 10 years down the line. In order to keep garden disruption to a minimum, the LEDs were run from a 12 volt supply – the cables don’t need to be armoured, buried and marked. Initially the client was sceptical but when we explained that the voltage drop is a lot less of an issue with LED garden lighting systems, he was satisfied. To benefit from professionally installed and fully certified mains outdoor lighting or 12 volt garden lighting talk to us on 020 3199 8248. You speak directly to an electrician, not a receptionist.